Celebrating 60 years of Disneyland! Disneyland - "The Happiest Place on Earth" Can this statement still be true, with two toddlers in tow?? We certainly both have happy memories of Disneyland, as kids ourselves, and as a childless couple. 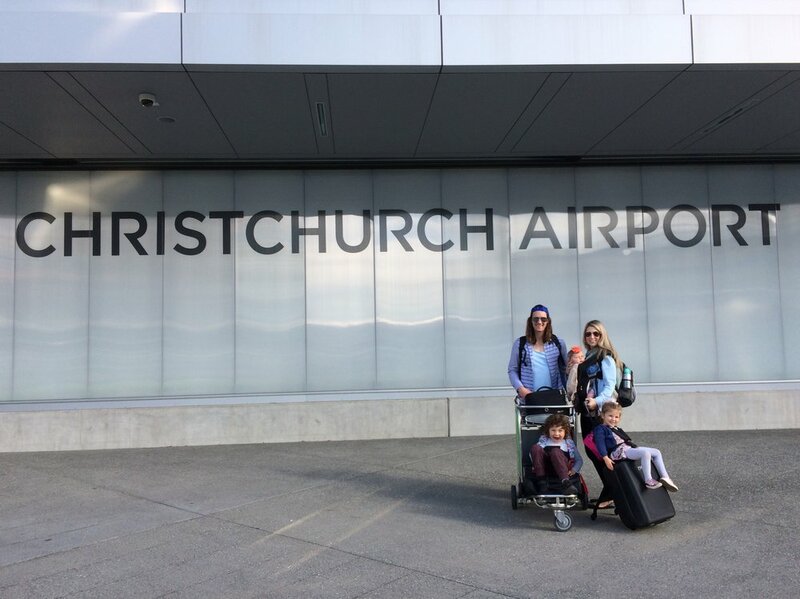 We were really eager to take our children to Disneyland and share the excitement and magic with them, that when Bodie was 3 years, and Lola 18 months old, we couldn't wait any longer, and booked our trip of a lifetime! We just had one mission....as we're sure a lot of you do.....to keep Disneyland our 'happy' place! We knew that this could be challenging, so we did a bit of research and found some great tips, and came up with a few of our own, that we would like to share with you! 1. PRE-PURCHASE TICKETS AND GET THERE EARLY! You have enough lines to wait in for the remainder of the day, so don't add another line, by starting off at the Ticket Counter! You can purchase tickets online, or at most Anaheim Hotels. In our case we purchased the Southern California City Pass, as we were on a 'Theme Park' Holiday and visiting other parks during our trip. You can read about our visit to Legoland here. This pass also gave us 'Magic Hour' entry, where we could enter the park an hour prior to the general public opening time. You also get Magic Hour entry, by staying at one of the Disneyland Resort Hotels. It is a special moment, as you get to see the rope drop on Main Street, and feel special as you are among the first to enter the park, and get to the front of the line on many rides! The best thing about the Disney FASTPASS is that it is free! All you need to do is insert your Disneyland Entry ticket into the FASTPASS machine, and you will be issued with a FASTPASS ticket with an allocated time to return to the ride, to enter the FASTPASS lane. The time slot to return is usually an hour, which is great if you are on another ride, or on the other side of the park! A tip, is to set an alarm on your phone for the starting time, you then know you have an hour from then to get to the ride. The FASTPASS machines are located nearby the actual ride you are wanting the pass for. The FASTPASSES do run out on some of the major rides, so another reason to get to the park early is to get your FASTPASSES early in the day. You can only have one FASTPASS issued at at time. We suggest getting the FASTPASS for the ride you most want to avoid a long line for, then ride some other rides while you wait for your allocated time. The exception is, you can have a FASTPASS for the World of Color Show, which is an evening water laser and fireworks show at California Adventure Park, at the same time as another FASTPASS. So if you want to see that show, which we recommend doing so, and want an up-close reserved area, which is great for the wee ones to be able to see properly, then head straight to the FASTPASS machine located by the Grizzly River Run, at California Adventure Park, as soon as you arrive at the park, as these run out early. Everyone in your group intending to ride, needs their own FASTPASS, however under 2's are not required to get one, as they do not have an actual Disney entry ticket. So, get your FASTPASS and make waiting in line with Toddlers easier! This is by far the best tip I found researching our trip to Disneyland. You see Disneyland isn't all about the kids! We love the rides also, and with a 'short' 18 month old in tow, we were thinking that as she wouldn't be able to go on a lot of the rides that our 'tall' 3 year old could go on, that we would have to have turns missing out on rides ourselves, while waiting with the little one. But no.....Rider Swap allows for one parent to line up in the normal line with the child, and after riding, being issued with a Rider Swap pass, that lets the child and the other parent skip to the front of the line to experience the ride also. Now, we are grown-up enough to accept that we might of had to miss out on the ride ourselves, but each being able to experience it with our excited little boy was priceless, as really, it is all about the kids, and seeing the magic and joy through their eyes! Just mention it to the cast member as you enter the ride, and you will be issued with a pass. Another great tip is that you can use this in conjunction with the FASTPASS, now you have just cut more waiting time! This one isn't for the kids, but seeing you are taking kids and can't ride on some of the rides with them, it is relevant. If you are like us, and love a roller coaster, and thrilling rides, that the kids just aren't big enough for, no matter how many extra pairs of socks you have stuffed into their shoes, then you will want to take advantage of the SINGLE RIDER lines. By entering this line, you generally get right to the front of the line and get to go on the ride as soon as a single seat becomes available. As most people are visiting the park in groups of two or more, and want to ride together, there are often single seats on rides that would otherwise go empty. So send the other parent off with the kids, to a kids show, or for nappy changing time, and go hit some of the big rides! FUN for ALL! Although it may be tempting to stay at one of the great OC beaches, that are reasonably close to Disneyland, I recommend actually staying in Anaheim to maximise your time at Disneyland and avoid early morning traffic driving there. Also, the car parks are actually located off-site, so you still need to walk at least 10-15 mins or transfer to a shuttle, so really driving yourself there isn't all that convenient. Besides, after a busy few days at Disneyland, you could then take a relaxing break at one of the OC beaches. We broke our Theme park holiday up at Laguna Beach, which you can read about here. Not all the hotels right by Disneyland are super expensive. You can find a hotel to suit any budget within walking distance, or if a little too far for tired little legs, almost all the hotels run complimentary shuttle services. Seeing Disneyland is open late into the night, staying nearby can mean that you can leave in the middle of the day for nap time, or a refreshing dip in your hotel pool, and re-enter later, all set to burn off that toddler afternoon energy, and happily enjoy the evening shows and parades. A note on the shuttles is that all strollers must be packed down, so unfortunately if your little one is sleeping then you need to wake them to get them out of the stroller. To avoid this, we decided to walk back to our hotel in the evenings that we wanted to stay past our little ones bed time. We would get her off to sleep in the stroller, PJ's on, bottle done, and then enjoy the rest of the evening without having to transition her twice and risk a tough re-settling time back at the hotel! We stayed at Embassy Suites by Hilton Anaheim South. It was about a 25 min walk, but it was a well lit, easy walk straight down Harbor Boulevard. (The same road that Disneyland is on). We highly recommend this hotel for families. The large atrium style lobby and restaurant area is enchanting, and the little ones will love seeing the lion sitting on top of a rock, surrounded by lush plant life and waterways, and cascading waterfall! There is a large heated pool and jacuzzi. All rooms are two-room suites, with separate bedroom and living room, great for large families. The hotel provided us with a pack n play (port-a-cot), and breakfast was included daily! This was excellent, as we didn't want to waste time finding a restaurant to eat breakfast at each morning, prior to heading to Disneyland. We could simply head downstairs and fill up on eggs or omelettes and toast, or cereal and fruit, or both, and then jump straight on the complimentary shuttle full of energy and ready for a big day ahead, with Minnie, Mickey, Goofy, Pluto, Donald & Daisy! 1. Snacks - for lines! Preferably long lasting ones, like lollipops! There is nothing like 'foodertainment'! 2. Take a stroller or hire one there! You can even hire doubles! 3. When hot, cool off in a Bugs Life Water Splash area at California Adventure Park. Having kids a great excuse for you to get in there and cool off too! 4. Do not miss the Pixar Parade at California Adventure Park to see all your kids favourite movie characters, Buzz Lightyear, Woody, Nemo, Dory, Crush, Monsters Inc, Bugs Life. It is like a dance party with water and bubbles and character interaction! The great thing is that it is during the day, so no need to force the kids to stay up all night! 5. If the aim of your day is to get as many character's photos and autographs as possible, then as soon as you see a character walking around the park line up straight away! Beeline that character, it is amazing how fast the line forms, people seem to appear from thin air! (Be aware that there is no guarantee that the character will still be greeting people by the time you get to the front of the line, there is often no notice, and they just say, sorry he/she will be back shortly - devastating for the kids! It's a shame that there isn't a cast member cutting the line off at a maximum number, but that's how it works for now, so as I said beeline that line! UPDATE: They have since worked this out, and now like we suggested, they have the cast member telling you when you can no longer join the line, and let you know that you can stay for a high-five walk by. You can read our updated tips from our latest trip here. 6. We bought the kids a Disney lanyard, with a card inserted that had a picture of Mickey or Minnie on one side, and on the other side, we wrote their name, our names, and our mobile phone number in case they got lost. Another great tip, is to take a photo of them at the start of the day, so if they are lost, you can quickly show the helpers what they look like and what they are wearing. As let's face it, sometimes with all that is going on it, is hard to remember, (especially if they dress themselves!) Luckily we didn't need to use either of these, and the kids just felt special, with 'special' tickets around their neck! ******Ohhhh, and one for the Mums (or Dad's if that's your style). Ditch the large baby bag, squeeze necessities like nappies, snacks, change of clothes for the kids, who will get wet, etc, under the stroller, and take an over the shoulder, across the body handbag. As you need to leave strollers outside of the rides, often out of sight, you don't want to have your large (possibly designer) baby bag just hanging off it, and having to take out the valuables, like camera, wallet and phone each time to somehow hold on the ride is just a pain! 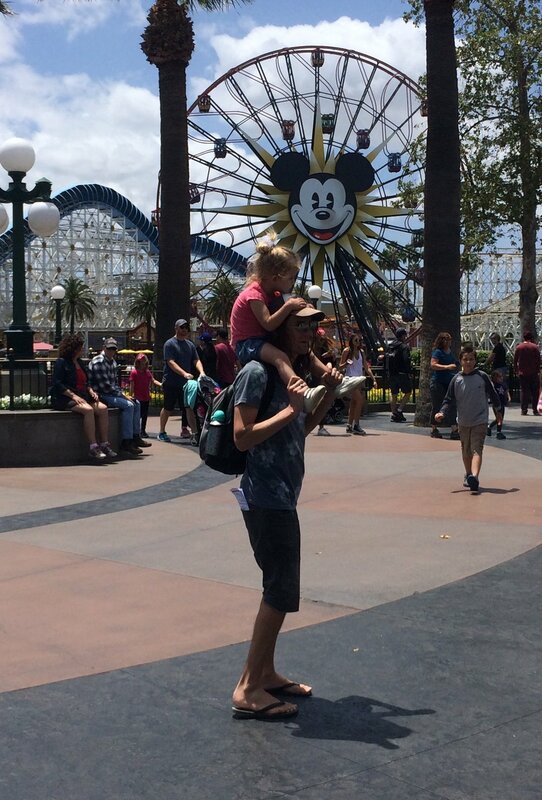 Small bags attached to your body are allowed on most rides, so you can easily take cute selfies of the kids! UPDATE: We've been again!! Read all about it here. Below are our essential recommedations for a fun, successful day at Disneyland!